This week, the New York Times and Marion Nestle both cover recent developments in the resulting controversy. Here are several thoughts, addressed to health policy advocates such as the American Public Health Association, NYC officials, and others. 1. You never should have called the proposed policy a ban. Has there ever been a controversy over the "ban" on SNAP spending for hula-hoops and yo-yos? The "ban" on SNAP spending for gasoline? No, you could say SNAP has made a sensible bureaucratic division between eligible goods and ineligible goods. People can use cash for all the ineligible goods. The proposed policy would slightly narrow the class of foods and beverages eligible for taxpayer support through SNAP benefits. 2. You should have emphasized the pilot nature of the proposal, and the research questions that will be investigated. In the NYT article, the quote from Kelly Brownell at Yale gets this right. The pilot should ask two questions: (a) does the proposed policy improve food and beverage choices?, and (b) did the proposed policy annoy participants or make them less likely to participate? Some, but not all, SNAP participants will like the new policy. Remember, low-income parents struggle with their children over food choices in the grocery aisle just like middle-income parents do. The soda companies have no evidence that this proposal will cause any problems whatsoever for SNAP participants. 3. You should have negotiated with the anti-hunger community before taking this proposal public. The quote in the NYT article from the Food Research and Action Center is a bad sign. Some health advocates have already written off the anti-hunger community as hopeless on health and obesity issues, but this is a mistake in political strategy. Key leaders in anti-hunger policy advocacy and the charitable emergency food system watch public concern about health and nutrition very closely, and calibrate their own programs accordingly. Health advocates have leverage with the anti-hunger community, which cannot afford to be indifferent to health issues. I think a bargain should have been possible. I liked it. It doesn't get an "A" on every plank of the checklist, but it does well on most. Friends have asked, does the video feed the notion that exercise alone without food is enough? The cafeteria tray at the start and apple at the end earn the video a B+ for food, not worse. Friends have asked, what about sexist stereotypes and high heels in the workout? Although she is a bit ... um ... unrestrained, Beyoncé seems like a star in command of her world happily flaunting good looks, very different from the nearly naked bodies explicitly at the service of a male star's gaze, which is more typical of the genre. In related workout videos, people wear more realistic clothes. Again, a B+ not worse. Making a school cafeteria and its neatly dressed students look cool and appealing gets an A. Message that physical fitness is cool and appropriate for kids of all sizes gets an A. Comments welcome. Food Producer: Jim Cochran, founder and co-owner of Swanton Berry Farm, started the first commercially successful organic strawberry operation in California and the first 100 percent unionized organic farm in the nation. Jim not only helped jumpstart the organic strawberry industry, but is also encouraging fair labor practices among sustainable growers. Young Food Leader (new category): Molly Rockamann, founder of the non-profit organization EarthDance Farms in Ferguson, MO, won for her efforts to cultivate a new generation of sustainable farming stewards in the Midwest. Through Molly’s unique apprenticeship program, urban St. Louis residents -- with ages spanning five decades -- learn the complete cycle of organic farming from seed to market. Knowledge Leader: Chef Ann Cooper is an outstanding leader in the national movement to ensure that all children have access to nutritious food at school. Known as the “Renegade Lunch Lady,” Ann started the Food Family Farming Foundation, which provides schools with the tools and guidance they need to transition from over-processed meals to healthy, fresh ingredients on a limited budget. Ann’s day job is in the trenches of the Boulder Valley School District, where she is transforming lunch menus in the entire 48-school district, just as she has done before on the east and west coasts. Business Leader: Pam Marrone is the CEO and founder of Marrone Bio Innovations, a leading developer of environmentally-responsible biopesticides based in Davis, California. MBI’s products use naturally occurring materials like plants and microorganisms to help growers control pests, maintain yields, and reduce risks to human health and the environment frequently associated with conventional pesticides. Having launched three successful companies to develop bio-based pesticide alternatives, Pam has created a strong business model in a rapidly growing industry. From a tour east of Tulare arranged through the World Ag Expo in February, with lots to see: juice manufacturing, a producer-owned packing cooperative, labor and contracting arrangements for harvest workers, irrigation, pest pressure, and strange windmills that run in reverse (they use power to blow wind through the fields on cold nights to protect against frost). Plus, lovely countryside. Denmark several years ago banned non-therapeutic use of antibiotics in livestock and poultry. This policy allows veterinarians to use antibiotics on animals who need the treatment, but it prevents the use of antibiotics in much larger quantities merely for growth promotion [Update: this post revised slightly to reflect that the ban affected all livestock and poultry, not just hogs]. Non-therapeutic use, which is common in the United States, threatens the future health of both farm animals and humans as microbes become resistant to the powerful medicines. The Danish experience shows that the ban on non-therapeutic use worked just fine. Ralph Loglisci of the Center for a Livable Future reports at Grist and the CLF blog. The editors of Scientific American recently encouraged U.S. hog farmers to "follow Denmark and stop giving farm animals low-dose antibiotics." 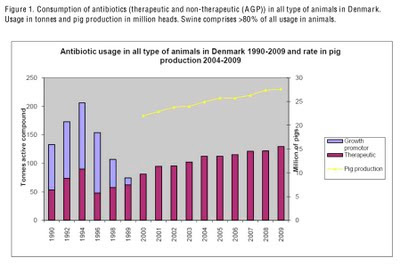 Sixteen years ago, in order to reduce the threat of increased development of antibiotic resistant bacteria in their food system and the environment, Denmark phased in an antibiotic growth promotant ban in food animal production. Guess what? According to Denmark's Ministry of Food, Agriculture and Fisheries the ban is working and the industry has continued to thrive. The government agency found that Danish livestock and poultry farmers used 37 percent less antibiotics in 2009 than in 1994, leading to overall reductions of antimicrobial resistance countrywide. Notice that the Danish ban is not a radical propopsal. It still allows a large amount of antibiotic use, as needed, and this therapeutic use has grown proportionately as the Danish industry has thrived and grown since the ban. What the ban accomplished was getting rid of the worst excesses in previous years. It is a sign of dysfunction in the American political system that similar proposals have been blocked here. Source: CLF blog. Click if needed for larger image. I have been contemplating the following proposal for years. Now that the national average gasoline price has reached $3.68, up more than 85 cents from a year ago, it is a good time to put this idea in writing. Congress should pass a law to increase national taxes on petroleum energy sources, using the following rate schedule: if the market price is higher than the equivalent of a gasoline price of $3.50 per gallon (as it currently is), there is no tax increase at all. If the market price falls below a gasoline price of $3.50 per gallon in the future, the tax increase raises the per gallon price by the difference between $3.50 and the (lower) market price. For example, if the market price falls to $3.25, the tax increase would be $0.25 per gallon. The consumer would pay $3.50 per gallon in that case. The goal of this proposal is to strengthen the incentive for consumers and businesses to invest in energy conservation and sustainable generation technologies. When petroleum energy prices are high, investments in conservation and sustainable technologies are more economical. When petroleum energy prices are low, it is not worthwhile for people to make these investments. For example, a manufacturer who is contemplating an investment in technology research to make a better hybrid car will have a greater profit if the petroleum energy price remains high. The manufacturer will lose money on the investment if the petroleum energy price falls. By providing assurance that the effective market price of petroleum will not fall below a certain point, this proposal takes away one of the greatest risks for consumers or businesses contemplating an investment in conservation or alternative technologies. For example, our hybrid vehicle manufacturer can count on customers who face an effective gasoline price of $3.50 or higher. If the manufacturer can produce a good vehicle at a reasonable price premium above the cost of conventional automobiles, this reassurance makes a big difference in the likely market for the vehicle (for example, see this break-even analysis or this online calculator). This proposal takes advantage of an important principle in consumer psychology, for which the economist Daniel Kahneman won a Nobel prize in 2002. Consumers seem to care more about avoiding losses than about achieving equivalent gains. It also seems fair to say that consumers care more about their economic situation today than they do about the future (in economic lingo, consumers frequently behave as if they have a surprisingly high discount rate). While this proposal changes the risk calculation for environmentally advantageous investments, it does not cost Congress or taxpayers anything this month or next month. It might never cost anything, if the market price for energy remains high. For voters and taxpayers who are today paying $3.68 a gallon, this proposal will never increase their energy costs beyond what they are paying today. These advantages might matter for environmental advocacy on behalf of a beneficial public policy. Higher energy prices are more economically sound (.pdf) than other forms of environmental regulation in energy markets. Yet environmentalists want to avoid the grief they get for seeming too cheerful about energy price increases that harm consumers. With this proposal, environmentalists need not advocate any harm to consumers, but merely that conservation and alternative technologies share a part of the good news if petroleum energy prices fall back down again. Have others proposed this policy previously?